Since I am easily influenced by large images flickering across a screen I have decided to make some changes in my grocery shopping habits.If you have not seen Food Inc. I highly recommend you check it out. I think the most eye opening part of the movie for me was the realization that packaged food really is not healthy and it barely resembles the food it tries so hard to imitate once you start reading the ingredient declaration. As a result, I have been trying not to purchase store bought crackers in 2010. 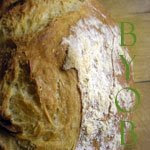 Somewhere in 2009 I joined BYOB and began baking my own bread when are where I could. Now that I have gotten comfortable with yeast and actually turned out a few good looking loaves of bread I am ready for a new challenge- yep Crackers! One of my favorites due to my belief that they are healthy are Wheat Thins. Well everyone take a look at these! I found a cracker recipe in King Arthur Whole Grain Baking. The ingredients sounded just strange enough for me to book mark the page for later consideration. This week as a cracker craving came calling I returned to the bookmark and said to myself... Vanilla in a cracker? The resulting cracker is very light and crisp with a salty sweet note melding well with the whole wheat flour. The recipe comes together quickly and the dough rolls out like a dream! So no excuses! Crackers are super simple to do yourself. *Additional salt for topping (optional) I would definitely add the salt topping for a more wheat thin like taste! 1. TO MAKE THE DOUGH: Combine the flour, sugar, salt and paprika in a medium bowl. Cut the butter into small pieces and mix it in thoroughly, using your fingers, a pastry blender, a mixer or a food processor. Combine the water and vanilla, and add to the flour mixture, mixing until smooth. 2. Preheat the oven to 400 degrees F. Lightly grease baking sheets or line with parchment paper. 3. TO ROLL AND CUT THE DOUGH: Divide the dough into 4 pieces; keep the other pieces covered while you work with one at a time. Lightly flour your work surface and your rolling pin and roll the piece of dough into a large rectangle, which should be at least 12 inches square when trimmed. Keep your pin and the surface of your dough evenly floured. Flip the dough frequently to keep it from sticking, but too much flour will make it difficult to roll. Keep rolling until the dough is as thin as you can get it without tearing, at least 1/16 inch thick. Trim the dough to even the edges and use a pizza cutter or a sharp knife to cut the piece into squares approximately 1 1/2 inches wide. 4. Transfer the squares to a prepared baking sheet; you can crowd them together, as they don't expand while baking. Sprinkle the squares lightly with salt, if desired. Repeat with the remaining pieces of dough. Save the scraps under plastic wrap and re roll them all at once just one time. 5. 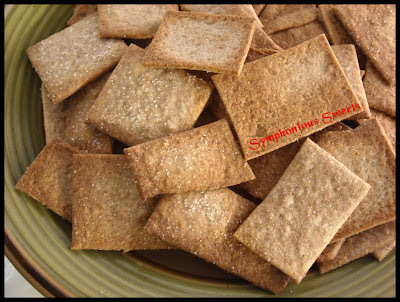 TO BAKE THE CRACKERS: Bake the crackers, one sheet at a time, until crisp and browned, 5 to 7 minutes. If some of the thinner crackers brown too quickly, remove them and return the remaining crackers to the oven to finish baking. These crackers bake quickly, so watch them closely - even 30 seconds can turn them from golden brown to toast! Remove the crackers from the oven and cool on the pan or on a plate; they cool quickly. These crackers will stay crisp for several days, but are best stored in airtight containers. Wow... I am so impressed. I've never made crackers. 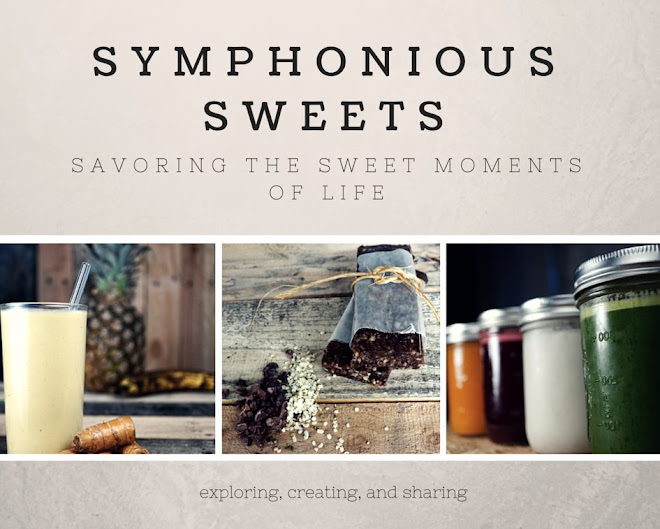 These sound awesome ( and fairly easy!) Definitely giving this a try! Oh, yea, thanks for posting this! I, too, am making it my goal to buy less packaged things this year (though I do like Triscuits and they only have 3 ingredients, so..). My kids love wheat thins and I haven't bought them in awhile, so they will love this.